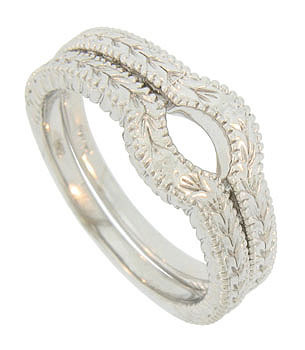 Repeating leaf and stem patterns adorn the face and sides of these 14K white gold stackable wedding bands. 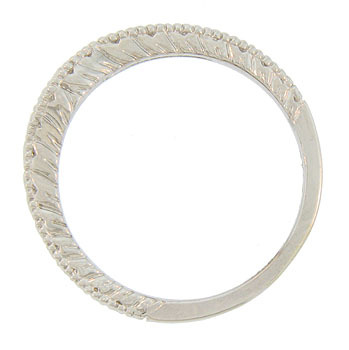 The center of the bands are indented so as to allow them to be seamlessly worn with an engagement ring. 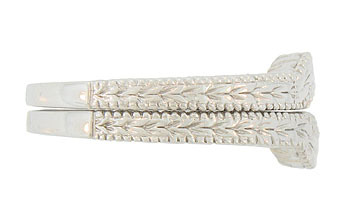 The band measures 3.05 mm in width. Photographed here with a R3044 (sold separately). Size 6 3/4. 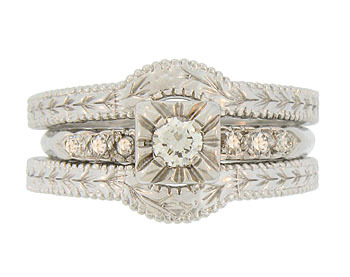 These rings are frequently purchased as a set for $650, but can also be purchased individually for $325. Can be special ordered in any size. Also available in 18K, yellow gold and platinum.